In this chapter we present the design and implementation of a robust passivity-based controller for a rolling-balancing system known as the disk-on-disk. The control design aims to asymptotically stabilize the desired equilibrium of the disk-on-disk by shaping the energy function of the system and injecting damping. This first design is further augmented by the addition of a nonlinear PID controller to compensate for disturbances. We incorporate in the nonlinear PID the possibility of stabilizing either a set-point of angular positions of the disks or their angular velocities while keeping the balance of the system. Although the underactuation feature of the system and the disturbances hamper the control design, we show that the passivity-based framework offers the necessary tools to prove the desired stability properties of the close loop. 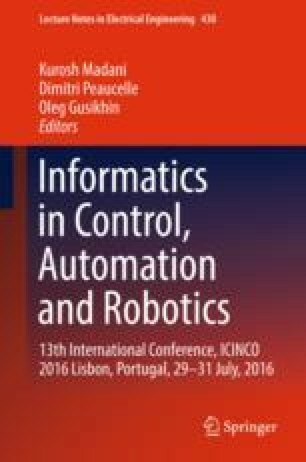 Finally, we evaluate the practical applicability of the control design by implementing the controller on a real hardware for the disk-on-disk system and asses the performance of the control system. This work was partially supported by the RoDyMan project, which has received funding from the European Research Council FP7 Ideas under Advanced Grant agreement number 320992. The authors are solely responsible for the content of this manuscript. The work of the second author at PRISMA Lab was support by the National University of Rosario, Argentina, under its internship program.